All of your user segments appear on the User Segments management page. After you create user segments, you can edit, duplicate, or delete those user segments as needed. You must be a Guide Manager to manage user segments. 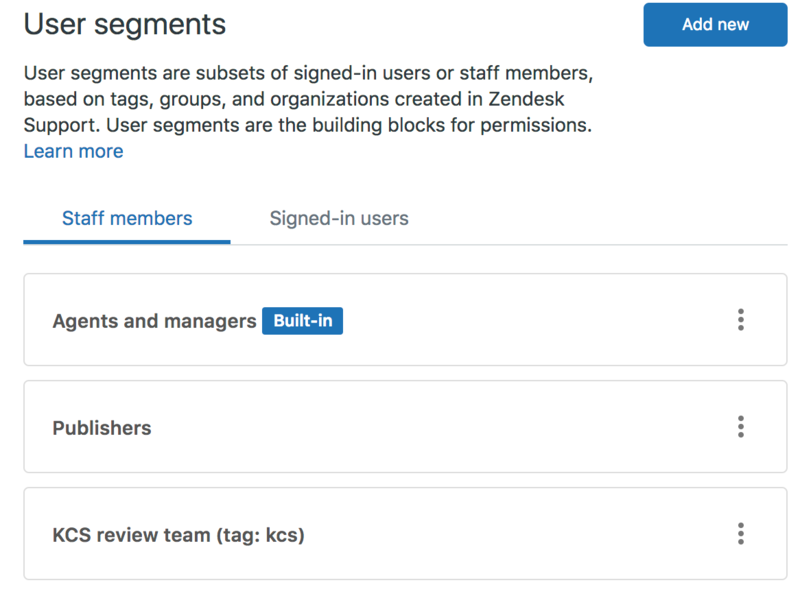 To apply user segments to determine user permissions, see Setting view permissions on articles with user segments and Create management permissions to define agent editing and publishing rights. User segments appear in each tab in the order in which they created, newest to oldest. You cannot rearrange user segments in the list. User segments appear on the Staff members tab and the Signed-in users tab. You can create user segments to define access to articles and topics in your Help Center. You can edit a user segment at any time to change the user type (signed-in or agents) or to update the tags, groups, or organizations that define the user segment. Click the user segment you want to edit. Alternatively, you can click the options menu at the end of the user segment, then select Edit. You cannot edit the built-in user segments. The user segment opens for you to edit. Make any changes you need to make. You cannot edit where a user segment is applied in the user segment itself but you can view click Applies to these articles to see a list of articles where the user segment is applied. You can create a duplicate of an existing user segment if you want to use it as a starting point for a new user segment. Click the options menu at the end of the user segment you want to duplicate, then select Duplicate. The duplicated user segment appears in your user segments list. The name of the user segment has copy appended to it. You can create user segments to define access to articles and topics in your Help Center. When you no longer need a user segment, you can delete it. You cannot delete a user segment if it is currently applied to a knowledge base article or a community topic. Click the options menu at the end of the user segment you want to delete, then select Delete. If the user segment is not currently applied to an article or topic, it is deleted and removed from your list of user segments. If the user segment is currently applied to an article or topic, you cannot delete it. In that case, you can edit the article or topic where the user segment is applied to change the user segment (see Setting view permissions on articles with user segments and Restricting access to community content). Are user segments available to be utilized in Guide Theme customizations? Can you be more specific about how you'd want to use these segments in your customizations? There's a lot that you can do with JS and CSS in Guide, but more detail on your use case will help us figure out if what you want to do is possible. We have a different segment for every client and creating a new section that is limited to one or more clients takes some trawling through the list. Unfortunately the Segment list can't be reorder - it will always list Segments in the order that they were created. This would be a great feature to have. If you're interested, we'd greatly appreciate you posting this in our Product feedback forum: Product Feedback. If an end user has both tag1 and tag2 we are expecting it to be mapped to all three segments but it is not happening. Hey Alok, thank you for reaching out. It is strange that you do not have this functionality working as expected. I set up a test within my own account and the behavior you described is happening within the account. I had 3 sections, each with a unique User Segment. The division of the Segments is as follows. I then created 3 unique users. The way this all shook out on my Guide was that TestUser12 had access to all three sections, as they were added to all three segments. it's important that the tags are added to the user profiles directly. Do you see on the profiles that they are members of multiple segments? If not, there is something else at play. Perhaps the third user is added to a unique segment rather than all three. During my testing I accidentally made a unique tag and unique user segment, which lead to no access to the first two segments.